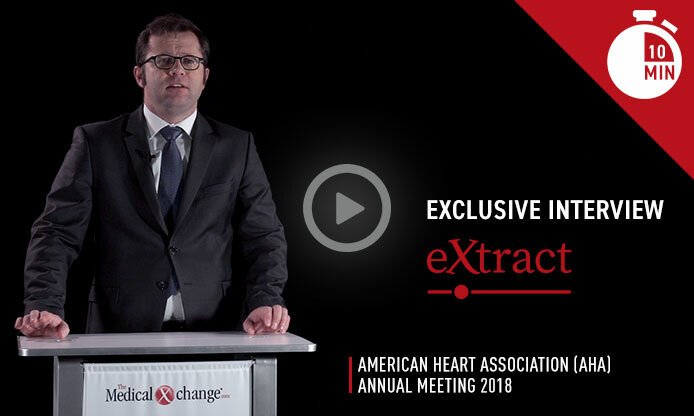 Chicago – Standard in-hospital management of heart failure is set to change on the basis of a multicenter late breaker trial presented at the 2018 AHA Scientific Sessions, according to expert opinion. The study showed that a guideline-directed therapy for outpatient care of heart failure is safe and effective when initiated in hospitalized patients. Although the primary endpoint of this trial was a surrogate neurohormonal biomarker, those in the experimental arm had a significantly lower rate of a composite of serious adverse events including readmission for heart failure at the end of eight weeks. The changes in the standard of care for hospitalized heart failure patients, which moves forward a treatment already known to slow disease progression, will be the first in more than 45 years. Results of the PIONEER-HF trial, presented at the 2018 AHA and published simultaneously (Velazquez EJ et al. N Engl J Med 2018; Nov 11 [epub ahead of print]), have demonstrated that a therapy effective for heart failure with reduced ejection fraction (HFrEF) can be safely and effectively initiated in the hospital. When compared to enalapril, the single-pill combination of the neprilysin inhibitor sacubitril and the angiotensin receptor blocker (ARB) valsartan (sacubitril/valsartan) not only provided a larger reduction in the concentration of N-terminal pro-B-type natriuretic peptide (NT-proBNP), a well-accepted biomarker of heart failure control, but also in the rate of adverse events associated with heart failure. The treatment was well tolerated. “These results support the in-hospital initiation of sacubitril/valsartan in stabilized patients with acute decompensated heart failure and reduced ejection fraction, irrespective of ACE inhibitor of prior ARB use or prior heart failure diagnosis,” reported Dr. Eric J. Velazquez, Chief of Cardiovascular Medicine, Yale University School of Medicine, New Haven, Connecticut. In the PIONEER-HF trial, conducted at 129 participating centers, 881 HFrEF patients were randomized to sacubitril/valsartan or enalapril after hemodynamic stabilization. The target dose in the experimental arm was 97 mg of sacubitril and 103 mg of valsartan twice daily. The target dose of enalapril was 10 mg twice daily. The primary outcome was NT-proBNP after four and eight weeks, but the two groups were also compared for adverse events related to heart failure as well as adverse events overall, including symptomatic hypotension, worsening of heart failure, and hyperkalemia. For the primary endpoint of NT-proBNP calculated as a geometric mean, there was 46.7% reduction in the sacubitril/valsartan group versus a 25.3% reduction (P<0.001) relative to baseline (Figure 1). This relative advantage for sacubitril/valsartan, observed almost immediately, achieved significance by the end of the first week. 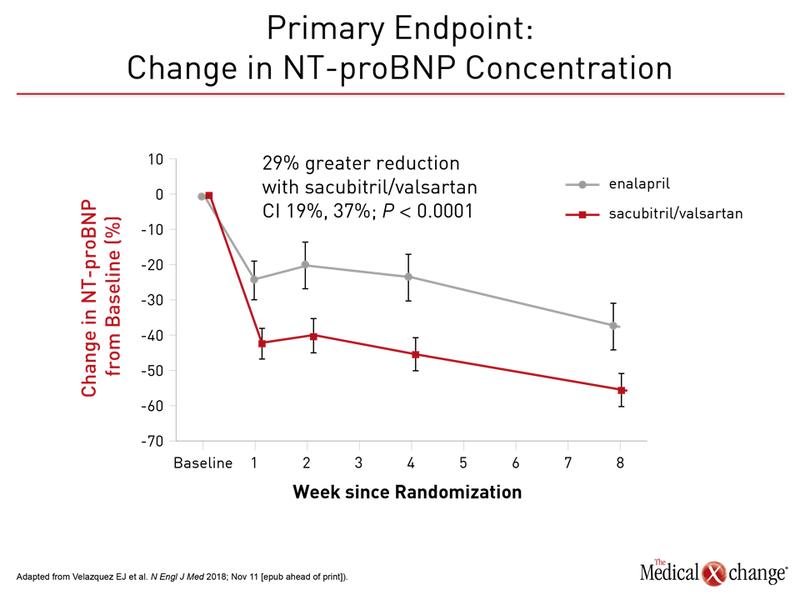 At this point, NT-proBNP was already 24% lower on sacubitril/valsartan than enalapril, and this relative advantage persisted or increased over subsequent follow up. 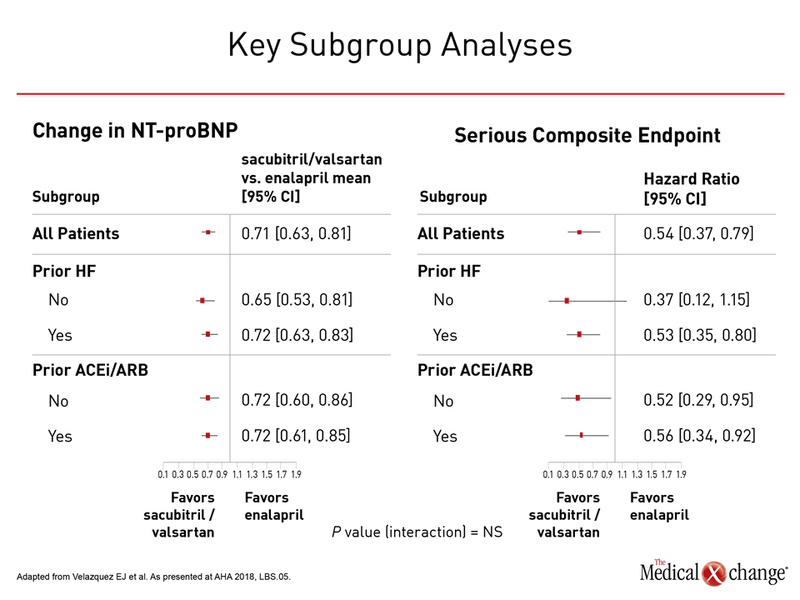 NT-proBNP is a biomarker of neurohormonal activation and hemodynamic stress that has been previously correlated with risk of adverse heart failure outcomes, but PIONEER-HF also associated sacubitril/valsartan with meaningful clinical advantages. Most importantly, there was a 46% reduction in a composite endpoint of serious events (9.3% vs. 16.8%) that included a 44% reduction in the risk of rehospitalizations for heart failure (8.0% vs. 13.8%) (Figure 2). An independent expert characterized a numerically lower rate of death from any cause (2.3% vs. 3.4%) as a “positive trend,” particularly in the context of a limited period of follow up. “The primary outcome was a surrogate, but this study demonstrated advantages for what matters to patients,” said Dr. Larry A. Allen, Division of Cardiology, University of Colorado School of Medicine, Aurora. Invited by the AHA to provide perspective on the PIONEER-HF, he characterized the reduction in heart failure rehospitalizations as “impressive.” He also stressed that the study confirms sacubitril/valsartan can be safely initiated in the hospital. The safety of initiating this therapy in the hospital was an important aspect of the study because the previously-published PARADIGM-HF trial already demonstrated that sacubitril/valsartan slows heart failure progression (McMurray JJV et al N Engl J Med 2014;371:993-1004). 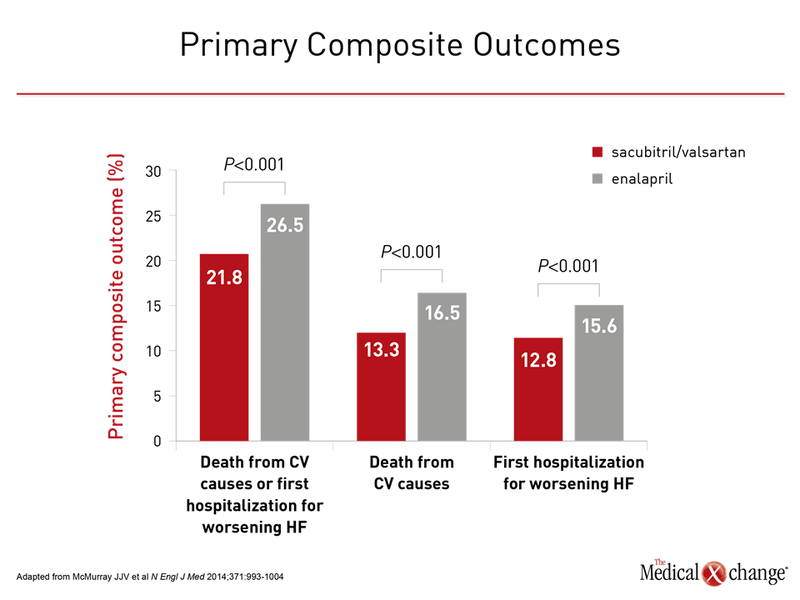 In PARADIGM-HF, the advantages of sacubitril/valsartan included a 20% reduction (P<0.001) in cardiovascular (CV) death and heart failure hospitalizations after a median of 27 months of follow up relative to enalapril (Figure 3). PARADIGM-HF “was a major success in the HFrEF realm,” said Dr. Allen, but he emphasized that better care that begins in the hospital is a major unmet need. Dr. Allen pointed out that, unlike the outpatient setting, where there have been a series of incremental improvements in heart failure treatment, in-hospital care has changed very little in decades. “We need better hospital treatment. All the action is in the hospital. This is where 70% of care is administered,” Dr. Allen said. He characterized PIONEER-HF as a breakthrough for several reasons. The first is that it improves outcome. Another is that it confirms that a treatment known to slow disease progression can be initiated earlier. Due to concerns about the vulnerability of hospitalized heart failure patients, the safety and tolerability of therapy targeting neurohormonal activation was a major focus of this study, but the rates of serious adverse events were low in both arms. 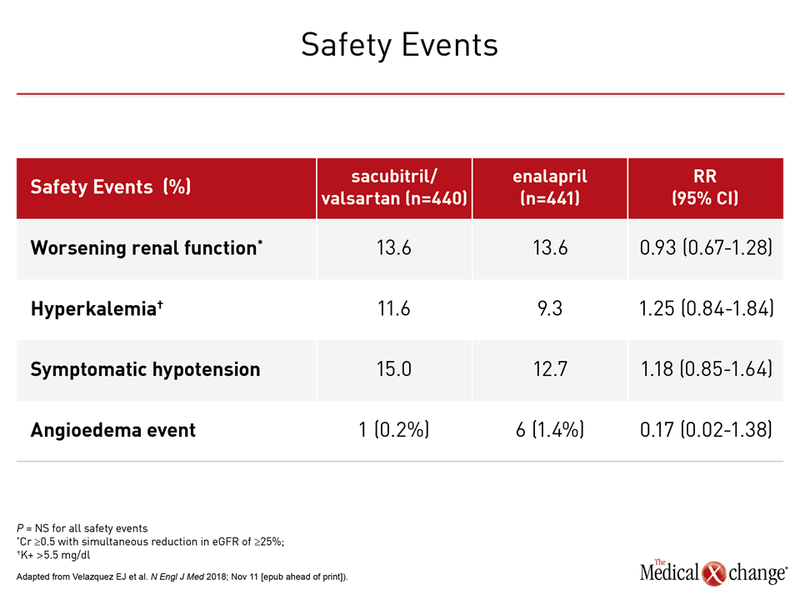 Hyperkalemia was slightly more common in the sacubitril/valsartan group (11.6% vs. 9.3%) but worsening renal function was slightly more common in the enalapril arm (13.6% vs. 14.7%). The rate of symptomatic hypotension was also numerically higher in the sacubitril/valsartan group (15.0% vs. 12.7%) but angioedema occurred more frequently among those randomized to enalapril (0.2% vs. 1.4%). None of these differences were statistically significant (Table 1). Sacubitril/valsartan was also well tolerated in PARADIGM-HF, but that study was testing a therapy that was not yet approved. It included long run-in phases and cautious upward titration of the assigned medications. Due to the rigorous protocol, almost 20% of those screened left the study before randomization. For PIONEER-HF, the major eligibility criteria were current hospitalization for HF, a left ventricular ejection fraction (LVEF) of ≤40%, a NT-proBNP of ≥1600 pg/ml, and hemodynamic stability defined as a systolic blood pressure of ≥100 mmHg, no increase in intravenous vasodilator and intravenous diuretics during the preceding six hours, and no use of inotropes during the preceding 24 hours. In the experimental arm, patients were started on one of two fixed-dose combinations: 24 mg sacubitril and 26 mg valsartan; or 49 mg sacubitril and 51 mg of valsartan. The starting doses in the enalapril arm were 2.5 mg or 5 mg. The choice of starting dose in both arms was guided by systolic blood pressure at randomization. All drugs were administered orally twice daily. Subsequent dose adjustments toward the target dose were prompted by a blood pressure based algorithm and investigator assessments. PIONEER-HF enrolled a characteristic hospitalized HFrEF population. More than 70% of patients were in New York Heart Association (NYHA) class III or IV heart failure. At baseline, the median NT-proBNP was 2283 pg/ml, the median LVEF was 25%, and the median eGFR was 58.5 ml/min/1.73m2. Women represented nearly 30% of the study population, and 36% were black. The median BMI was slightly more than 30. The relative improvement for sacubitril/valsartan versus enalapril was consistent for all stratifications evaluated, including gender, race, heart failure history (yes or no), age older than 65, renal impairment (defined as <60 ml/min/1.73m2), severity of heart failure, or high relative NT-proBNP levels (defined as >2701 pg/ml) (Figure 4). “The benefit of sacubitril/valsartan was broadly consistent,” Dr. Velasquez confirmed. He indicated that the results validate the safety and efficacy of the starting doses and titration schemes of in-hospital initiation of sacubitril/valsartan. 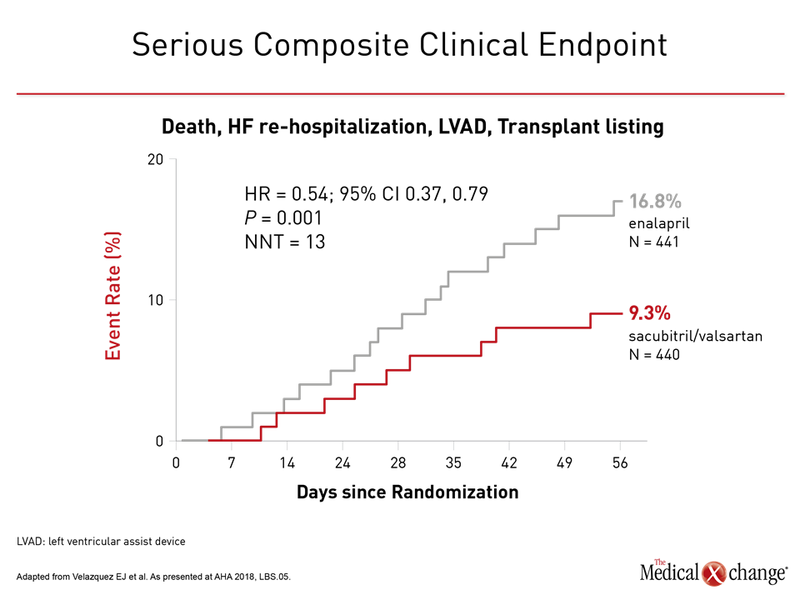 These data can be contrasted with a substantial number of previous trials in hospitalized heart failure patients that failed to demonstrate safety, efficacy or both, according to Dr. Allen. Over a more than 20-year time period when major trials have demonstrated a benefit for adding ACE inhibitors, beta blockers, and mineralocorticoid receptor antagonists to standard outpatient therapy for heart failure, some of the major trials that failed to confirm benefit for inpatients include ASCEND (nesiritide), EVEREST (tolvaptan), and RELAX (serelaxin), Dr. Allen reported. “There has been a need for a study like PIONEER-HF that shows benefit in the hospitalized heart failure population,” Dr. Allen said. Other than the opportunity of offering earlier protection from neurohormonal activation and the processes that drive heart failure progression, Dr. Allen also believes that starting sacubitril/valsartan in the hospital will provide more efficient heart failure management. Keeping is simple might also mean better outcomes based on US data that suggest that less than 15% of HFrEF patients who are eligible for sacubitril/valsartan are taking this combination, according to Dr. Allen. The reason for the low uptake despite a strong recommendation in guidelines from the Canadian Cardiovascular Society (CCS), the AHA, and the European Society of Cardiology (ESC) is unclear, but Dr. Allen suspects “clinical inertia.” He pointed out that guidelines, including those from the CCS (Ezekowitz JA et al. Can J Cardiol 2017;33:1342-1433), recommend a 36-hour washout when switching patients from an ACE inhibitor to sacubitril/valsartan to avoid the risk of angioedema. Although this step must still be performed in the in-patient setting, eliminating this step in the outpatient setting may remove an obstacle for those uncomfortable in taking this step. “PIONEER-HF gives us the evidence to start this guideline-recommended therapy from the beginning,” Dr. Allen said. This keeps the strategy easy to follow. PARADIGM-HF provided the proof that combining a neprilysin inhibitor with an inhibitor of renin-angiotensin system (RAS) inhibits neurohormonal activation and provides greater protection against advancing heart failure than a RAS inhibitor alone. PIONEER-HF reinforces the tolerability of sacubitril/valsartan and demonstrates that clinical benefits can be gained when this therapy is initiated as soon as patients are hemodynamically stable. A major trial demonstrating benefit from initiating sacubitril/valsartan for HFrEF in the hospital is expected to alter the standard of care and change guidelines. By showing safety and tolerability as well as efficacy in the hospital setting, it permits a therapy already shown to improve outcomes to be moved forward. Although this treatment is already guideline-recommended for HFrEF in the outpatient setting, initiation of sacubitril/valsartan in the hospital will, among other advantages, simplify HFrEF management.